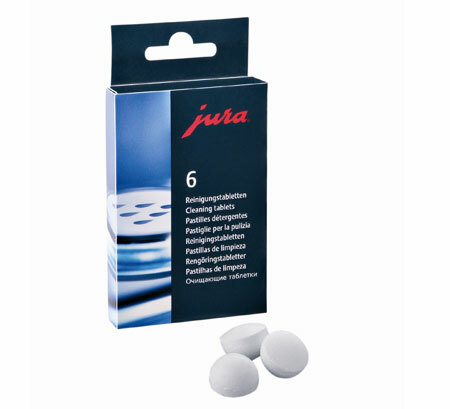 JURA Impressa cleaning tablets are specifically suited to the integrated cleaning programme. This protects your coffee machine, extends its service life and keeps your coffee quality consistently at the highest level. JURA Impressa cleaning tablets, pack containing 6 pcs. the tablets are dissolved in water at a temperature of at least 90 °C. The product is an irritant, i.e. temporary, protracted or repeated contact with the skin can lead to inflammation. accordance with the applicable conditions of the Washing and Cleaning Agents Act (WRMG – German Law). S26: In case of contact with eyes, rinse immediately with plenty of water and consult a doctor. If the tablet, abraded material from the tablet or the prepared cleaning solution gets into the eyes, immediately rinse with plenty of water. If the tablet, abraded material from the tablet or the prepared cleaning solution is swallowed, rinse out the mouth and drink plenty of water. If the cleaning solution gets onto the skin, immediately rinse off with plenty of water. 1. Place a receptacle under the coffee spout. 2. Start the cleaning operation as described in the operating instructions.